Policy Paper: "Op PRESENCE - Mali: Continuity over change in Canada's '​Return to Peacekeeping' in Africa" , Canadian Global Affairs Institute (October 2018). Op-Ed (paywall) based on above full report: "Three months in, here's what's at stake in Canada's Mali mission," The Hill Times (7 November 2018). Policy Perspective on the crisis in Cameroon: "Ambazonia: Justin Trudeau's Biafra? ", Canadian Global Affairs Institute (September 2018). Book review essay of Black (2015) Canada and Africa in the New Millennium & Engler (2015) Canada in Africa: 300 Years of Aid and Exploitation in the Journal of African Military History, Vol. 1, No. 2 (2018). OpenCanada.org: "Fighting Poverty by cultivating business: Recommendations for Canada's Development Finance Institution," OpenCanada.org (21 September 2017). Journal Special Issue: ​Journal of Military and Strategic Studies, co-edited with Tim Stapleton, "Revisiting Africa in Canadian Security Planning and Assessment," Vol. 17, No. 2 (Oct 2016). "Peace operations in Africa: Is Canada making decisions before knowing its strategy?" OpenCanada.org (26 August 2016). Book chapter: "The Other Resource Curse: Extractives as Development Panacea," Chapter 3 in Hany Besada, ed., Governing Natural Resources for Africa's Development (Routledge, 2016). Book review of Elizabeth Schmidt, Foreign Intervention in Africa: From the cold war to the war on terror (New York: Cambridge University press, 2013) in Canadian Journal of African Studies. Book review of Danielle Resnick & Nicolas van de Walle, eds., Democratic Trajectories in Africa: Unravelling the Impact of Foreign Aid (New York: Oxford University Press, 2013) in Journal of Retracing Africa. 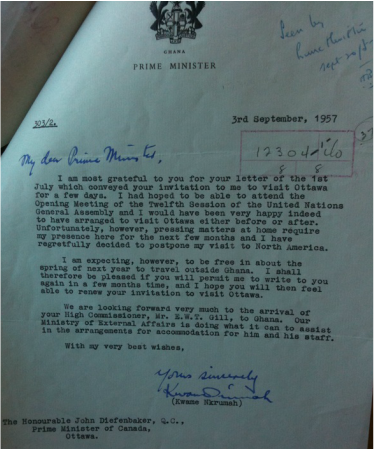 From the Canadian National Archives, the original letter from Prime Minister Nkrumah to Prime Minister Diefenbaker (3rd September 1957) postponing an intended visit to Canada. Nkrumah did visit Canada and the USA the following year.